Previously, Michiel explained the importance of environmental storytelling and how this is relevant to the game Lumini. If you missed this, you can read all about it here. In this blog, I will explain how this, in turn, is important in creating concept art. Concept art is an important part of any design process since its purpose is to visually explain an idea to others. The latter refers to members of the team, clients or the target audience. The concept art has to explain the idea for itself instead of being supported by walls of text or explanations from the presenter. Of course, there are a lot of distinctions between the quality of the concept art: they can be rough sketches quickly doodled in line-art (often only shown within the team) or more detailed sketches also showing color, art style and interesting compositions. This also depends on the use of the art: is it a concept image for promotional purposes, or is it just to sketch out basic shapes for building blocks? 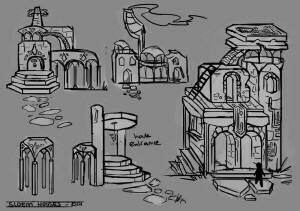 In the example below you can see variations in concept art for the game. 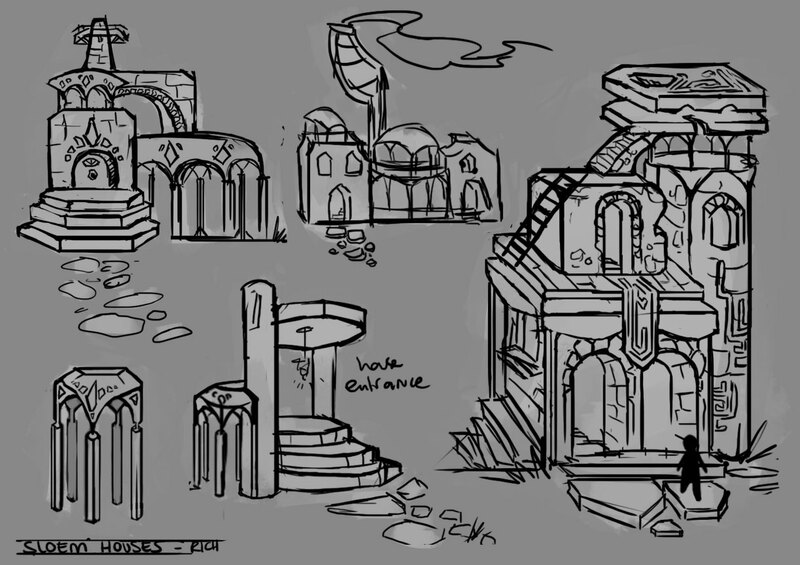 The first picture is a quick sketch of what some of the buildings of the previous civilization looked like. Second is a promotional concept art (made by Brenda van Vugt) introducing the yellow Lumini. The concept art we create is mainly due to Olof, who builds the worlds in Unity. Using the panorama concept art as a reference he can define what kindof assets will be needed and what compositions can be created. The panoramas also have a lot of color in them and set a certain atmosphere for that world as is already explained in a previous blogpost. Creating the right atmosphere is essential, since Lumini is a game that requires emotional involvement from the player. 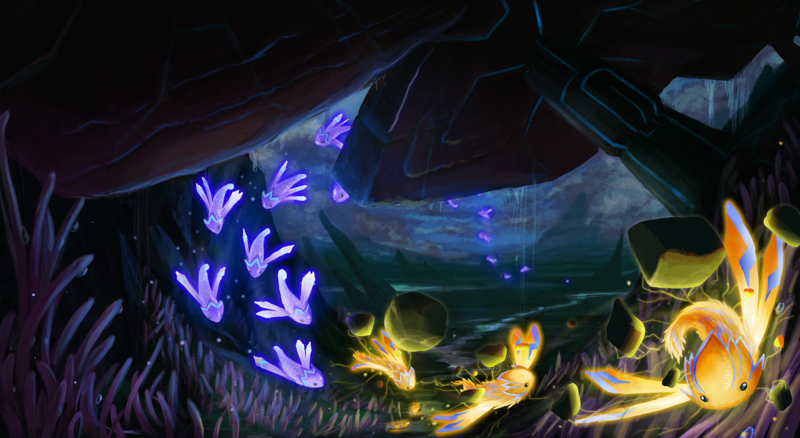 We have concept art for many different purposes, such as environments, creatures and assets. It is important to keep narrative in mind, especially with the environment since we want the world to speak for itself. Because of this, creating concept art can sometimes be rather challenging. For example each world in Lumini has 4 to 5 narrative locations where we want to reveal more about the story behind Lumini. When creating the look, feel and composition of such a location, the artist needs to know what to focus on. When creating concept art and not keep in mind the narrative elements the story won’t come through. What you’re left with is a pretty drawing that feels empty. The image above is a narrative location in the forest that shows the wealth of the previous civilization. It also has an open spot that shows the Heart which is very important later in the game. Composition wise all elements point to the Heart while still focusing on the crystal that is crucial in the story. With assets it’s a little different. Here narrative comes into the picture again by keeping in mind the fact that the setting is an alien planet, so we need the flora and fauna to emphasize that. The next thing you need to consider is the use of an asset. Is it a building block or will it just be used to fill up the background? Does it have influence on gameplay? The images below are examples of different types of assets we use. These are three of many types of plants created for the Forest world. Each plant has its own purpose. From left to right: The “ Vikingplant Meneer” , which is a building block that serves as an obstacle, next we have the “Lily”, which interacts with gameplay and last there is the “Duckplant” which’ role is to simply fill in the background.